After gaining just short of 200-points on Thursday, the NIFTY chose to consolidate on Friday and spent the session in a much capped range oscillating in a narrow 40-points range. The benchmark index ended flat gaining just 6.45 points or 0.06%. As we approach the fresh week from Monday, we expect this consolidation to spill over on Monday. The global markets have been weak following the ongoing rhetoric over tariff war between US and China. We may face a slightly weak opening early on Monday. However, going ahead, we expect resilient from the Indian Markets and we may see very limited losses and relative outperformance as compared to other global markets. Any extended weakness will see 200-DMA playing out as extremely crucial supports. Monday’s session will see the levels of 10365 and 10390 playing out as immediate resistance levels. Supports come in at 10275 and 10200 zones. 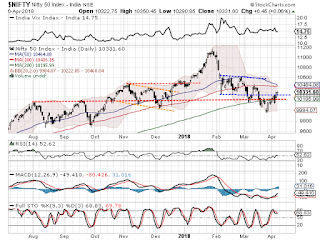 The Relative Strength Index – RSI on the Daily Chart is 52.6210 and it has marked a fresh 14-period high which is bullish. It does not show any divergence against the price. Daily MACD stays comfortably bullish while trading above its signal line. No significant formations on Candles that can be read in the present context were observed. 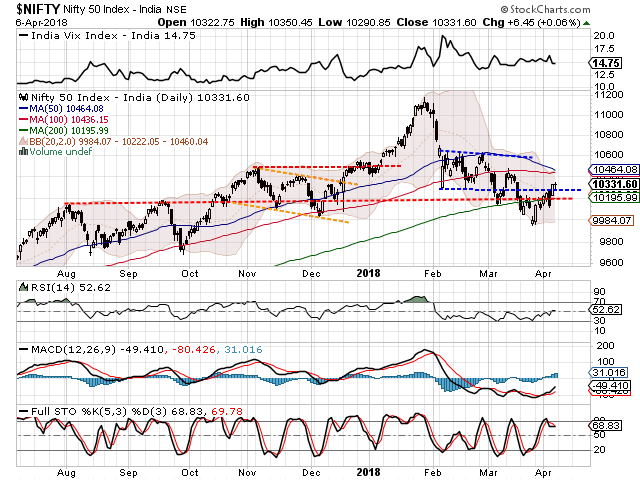 The pattern analysis shows that as the NIFTY crawled back above the 10180-10200 zones, it has not only moved past the 200-DMA mark but has also crawled back above the important multiple pattern resistance area. Any consolidation or corrective move will see these zones playing out as very important support area. Overall, global weakness is much likely to affect us as we open on Monday. At the same time, we are also likely to see resilience showing up as well. The Markets continue to trade above its major support levels and continue to remain in the overall uptrend. Any dip that the global weakness presents should be lapped up in making select purchases. The broader indices have shown evident improvement in relative momentum against the general markets and we will continue to see strong stock specific out-performances taking place. Cautiously positive outlook is advised for the day. Fresh long positions were seen being added in IDBI, ITC, CGPOWER, BANKINDIA, PTC, PC JEWELLER, NTPC, HCC, FEDERAL BANK, JUBILANT FOOD, TATA MOTORS and IOC.